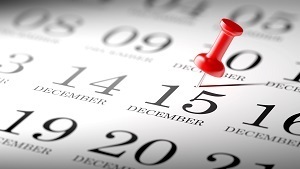 OSHA has extended the date that employers must electronically report injury and illness data through the Injury Tracking Application (ITA) to Dec. 15, 2017. This extension allows employers additional time to become familiar with the new electronic reporting system that was launched Aug. 1, 2017. OSHA’s final rule to Improve Tracking of Workplace Injuries and Illnesses requires certain employers to electronically submit injury and illness information that they are already required to keep under existing OSHA regulations. For more information, see the news release. Didion Milling Inc. faces $1,837,861 in proposed fines after five workers died and 12 others were injured in an explosion at the corn milling facility in Cambria, Wis. An OSHA investigation found that the company failed to correct an accumulation and leakage of highly combustible grain dust; maintain equipment to control ignition sources; provide employees with adequate personal protective equipment; and correct malfunctioning dust collection systems. 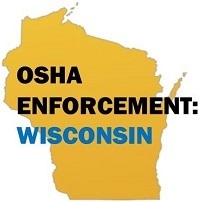 Didion was cited for 14 willful and five serious violations, and placed in OSHA’s Severe Violator Enforcement Program. For more information, read the news release. Reinforced plastic tarps, commonly called “Blue Roofs,” provide temporary protection for the roofs of homes and other buildings damaged during severe weather such as a hurricane or tornado. When employees access roofs to install these tarps, they are at risk of falls, electrocutions, and other hazards. In a new fact sheet, OSHA recommends steps that employers can follow to help keep workers safe. The owner of Pittsburgh-based business A Rooter Man pleaded guilty in federal court to a charge of willfully violating an OSHA regulation, resulting in the death of a worker. In September 2015, an employee was fatally injured when the trench he was working in collapsed. The worker was replacing a sewer line 11 feet below the surface in unstable soil with no cave-in protection, at the direction of the company owner, Wayne George. George pleaded guilty to not taking protective measures against cave-ins before permitting employees to work in trenches. Sentencing, which could include prison, is scheduled for February 2018. For details, see the news release. OSHA inspectors responded to a hazardous incident at Tampa Electric Co.’s facility in Gibsonton, Florida, that sent four workers to the hospital. Inspectors determined that anhydrous ammonia, a chemical refrigerant, was released when a relief valve activated after a pipeline became over-pressurized. OSHA cited the company for failing to ensure that workers wore appropriate respiratory protection, and for not including all minimum requirements in their emergency response plan. Critical Intervention Services, a security services provider, was also cited for not training workers on hazardous chemicals, and failing to develop and implement a written hazard communication program. Proposed fines for both companies total $43,458. For more information, read the news release. The Washington Division of Occupational Safety and Health (DOSH) issued $115,740 in penalties to Sayde Construction Inc. for safety violations identified after a worker installing roof trusses fell about 20 feet to his death. DOSH inspectors determined that the company failed to provide appropriate fall protection and ensure that workers used it, and did not have a written fall protection plan. For more information, read the news release. 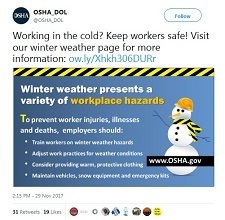 The Arizona Division of Occupational Safety and Health (ADOSH) issued $88,000 in penalties to Process Cooling International in Saint Helena for safety violations following the death of a worker who fell through a skylight. ADOSH inspectors concluded that the company failed to correct an imminent hazard, and failed to protect workers from potential fall hazards with skylight screens or guardrails. Although the hurricanes are over, their impact continues with hazardous and unstable conditions for both residents, and cleanup and recovery workers. OSHA and the International Safety Equipment Association (ISEA) are teaming up to coordinate and distribute much-needed personal protective equipment to hurricane-affected areas in Texas and the Caribbean Basin, including Puerto Rico. “OSHA’s goal is to keep workers and volunteers safe while they perform cleanup and recovery operations, and the ISEA is an important partner in these efforts,” said Deputy Assistant Secretary of Labor for Occupational Safety and Health Loren Sweatt. Information on specific safety equipment and how to stay safe during storm cleanup and recovery can be found on OSHA’s Hurricane Preparedness and Response page, and on the ISEA Storm Cleanup: Safety Equipment Resource Center page. The OSHA Training Institute (OTI) is celebrating the 25th anniversary of its education center program this year. OTI Education Centers have grown from four to 39 non-profit organizations, offering training on OSHA standards, and occupational safety and health issues to workers and employers nationwide. During their 25-year history, the education centers have trained more than 600,000 students in areas of high injury and illness rates. To find the nearest education center, visit the OTI Education Center Locations page. On Nov. 17, OSHA met with a three-member Serbian delegation to discuss best practices in the management of a whistleblower protection program. The delegation was in Washington, D.C., to kick off a three-week visit to several U.S. cities as part of the Department of State’s International Visitor Leadership Program. Members of the delegation learned how OSHA’s whistleblower program handles Sarbanes-Oxley Act (SOX) and Consumer Financial Protection Act (CFPA) cases. In Serbia they will be involved with new anti-corruption and fraud units. R.C. Bigelow is a marketer of blended teas headquartered in Fairfield, Conn. The company’s Boise, Idaho, distribution facility contacted OSHA’s On-Site Consultation Program for help lowering its rate of recordable injuries. Bigelow used the consultation visit to begin a team approach to instilling ownership of safety practices and principles at all levels of the organization. The company has since reduced its injury and illness rates below the industry national average. This dedication to protecting workers earned it acceptance into OSHA’s Safety and Health Achievement Recognition Program, which recognizes small businesses that operate an exemplary safety and health program. For more information, see Bigelow’s success story.